Larry Catá Backer's comments on current issues in transnational law and policy. These essays focus on the constitution of regulatory communities (political, economic, and religious) as they manage their constituencies and the conflicts between them. The context is globalization. This is an academic field-free zone: expect to travel "without documents" through the sometimes strongly guarded boundaries of international relations, constitutional, international, comparative, and corporate law. The Know Your Rights New York project targets the Chinese immigrant community in New York, and especially those communities in the greater New York City area. 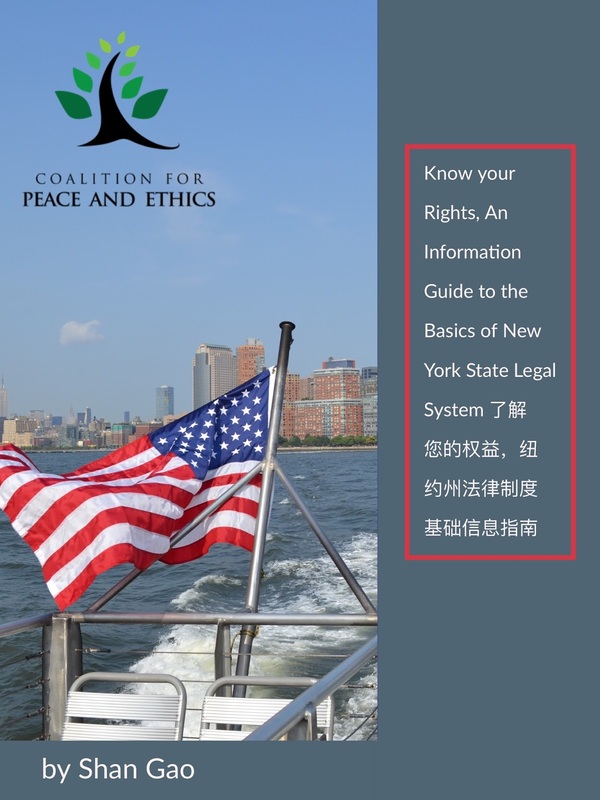 The laboring oar for the Know Your Rights New York project was undertaken by Shan Gao, who developed the approach and did much of the design work for the information booklet. It is Mr. Gao's voice that one hears on the audio version of the Know Your Rights New York booklet.Eventually we hope to augment the offerings with video segments that may be useful for our audience. We hope this is the first of other similar projects that will target immigrant and other communities whose access to information tends to be more constrained. This is in keeping with our mission to bring information, knowledge and greater control over everyday lives to people who are otherwise more likely to sit at the margins of mainstream society and mainstream social discourse. Having the tools to manage one's life is an essential element to individual dignity and to be able to take advantage of those opportunities society makes available to all. Future projects include outreach to other immigrant groups as well as to other groups whose access to basic information may be more limited. The introduction and links to the booklet and audio follow. Starting a new life in a foreign land has always been exciting for many new immigrants, but it can also be quite challenging and stressful: there is so much to learn. Language and culture barriers sometimes make this process even harder. When you have an unexpected dispute with your neighbors, your sellers, your landlords, or your local government agencies, you have no clue how to react or proceed. You worried that others might take advantage of you. America is a civilized society with rule of law: it promotes justice and fairness while condemns violence and inequitable acts. It has a long history of common law tradition and evolving democratic social culture. It is not uncommon that some norms and practice adopted by new immigrants from their home country might not conform with the standard here. Sometimes, misunderstanding could be dangerous and illegal. The mission of this booklet is to provide new immigrants a framework of basic knowledge about American legal system and concept (New York State as an example) in their native language, so they could be more confident and comfortable in terms of understanding the nature of their disputes, and taking proper action to resolve such disputes. This booklet invites new immigrants to take advantage of the information provided here to understand and respect American legal culture and rules, to protect their rights and liberty, to get the help they need. The research and drafting of this booklet is supervised and supported by Larry Catá Backer (白 轲) a director of the Coalition for Peace & Ethics (“CPE”), an independent organization founded in 2006, which engages and promotes the production and dissemination of knowledge that is meant to empower people to take control of their lives for personal and societal betterment in ways that are respectful to individuals and the communities to which they belong. Its website can be accessed at http://thecpe.org. Backer also serves on the faculty at Pennsylvania State where he teaches classes in law. . Dr. Gao is a member of CPE. Individual postings may now be more easily printed. To print, FIRST, click on the title of the essay you want to print, THEN scroll down to the "Labels" line near the end of the essay and CLICK on "print this article." All essays are (c) Larry Catá Backer except where otherwise noted. All rights reserved. Larry Catá Backer, [Essay Title], Law at the End of the Day, ([Essay Posting Date]) available at [http address]. The author holds a faculty appointment at Pennsylvania State University. Notice is hereby given that irrespective of that appointment, this blog serves as a purely personal enterprise created to serve as an independent site focusing on issues of general concern to the public. The views and opinions expressed here are those of its author. This site is neither affiliated with nor does it in any way state, reflect, or represent the views of Pennsylvania State University or any of its entities, units or affiliates. Here you can find my published work, manuscripts, presentations, and more! of scholarship that critically addresses key issues and theoretical debates in comparative and transnational law. Volumes in the series will focus on the consequential effects of globalization, including emerging frameworks and processes for the internationalization, legal harmonization, juridification and democratization of law among increasingly connected political, economic, religious, cultural, ethnic and other functionally differentiated governance communities. This series is intended as a resource for scholars, students, policy makers and civil society actors, and will include a balance of theoretical and policy studies in single-authored volumes and collections of original essays. U.S.-Cuba Trade and Economic Council, Inc. I hope you enjoy these essays. Each treats aspects of the relationship between law, broadly understood, and human organization. My essays are about government and governance, based on the following assumptions: Humans organize themselves in all sorts of ways. We bind ourselves to organization by all sorts of instruments. Law has been deployed to elaborate differences between economic organizations (principally corporations, partnerships and other entities), political organization (the state, supra-national, international, and non-governmental organizations), religious, ethnic and family organization. I am not convinced that these separations, now sometimes blindly embraced, are particularly useful. This skepticism serves as the foundation of the essays here. My thanks to Arianna Backer for research assistance. (c) Larry Catá Backer, all worldwide rights reserved. Travel theme. Powered by Blogger.